Madera County is another in a series of Central Valley-to-Sierran crest counties that parallel each other along the western slope of the Sierra Nevada. It was one of the last counties to be created, born in 1893 from Fresno County territory. This is long time after the Gold Rush but perhaps silver mining — a major political issue in the United State then — was involved. It is an interesting county from a county birder's perspective because of access difficulties. While one can reach boreal forest up to ~7500' elev (2285 m) on Beasore Road, no road crosses the High Sierra at this point. 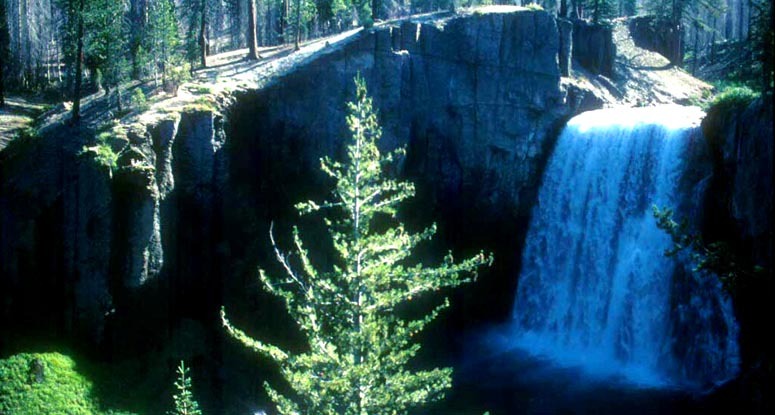 To reach the Hudsonian forests in lovely Devils Postpile National Monument, one must skirt the Sierra Nevada well to the south, or cross it well to the north, and then backtrack over the crest and down the west slope of the divide from the Mammoth Mt. area of Mono County. In the Central Valley, there are nice wastewater ponds at Chowchilla and Madera. Other popular birding sites are Bass, Hensley, and Eastman lakes, each with its pair of nesting Bald Eagles. 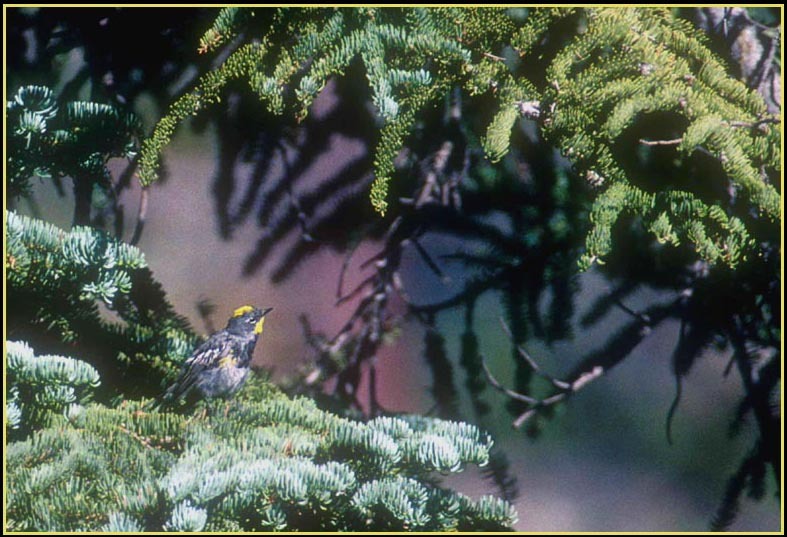 For Madera County a treetop warbler is featured: a breeding-plumaged "Audubon's" Yellow-rumped Warbler among boughs of fir. This was in the High Sierra at Devils Postpile Nat'l Monument, where it is a common breeder. That same day (19 Aug 1998) I photographed this migrant Selasphorus hummingbird (below left). 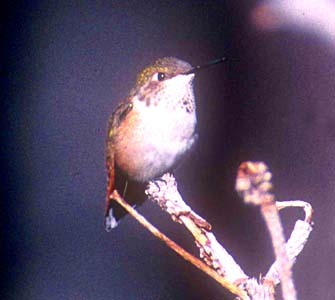 Although an immature bird and not identifiable on plumage, it is almost certainly a Rufous Hummingbird on date and locale. 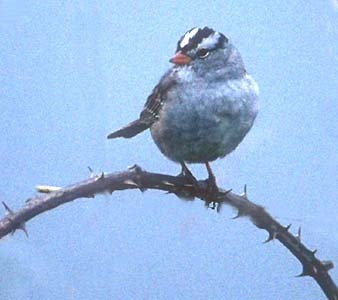 The White-crowned Sparrow (below right; 11 Apr 1998) was wintering at Chowchilla in the Central Valley; it appears to be of the Alaskan race gambelii. I liked the composition of the photo with the sparrow perched on an arch of thorns. 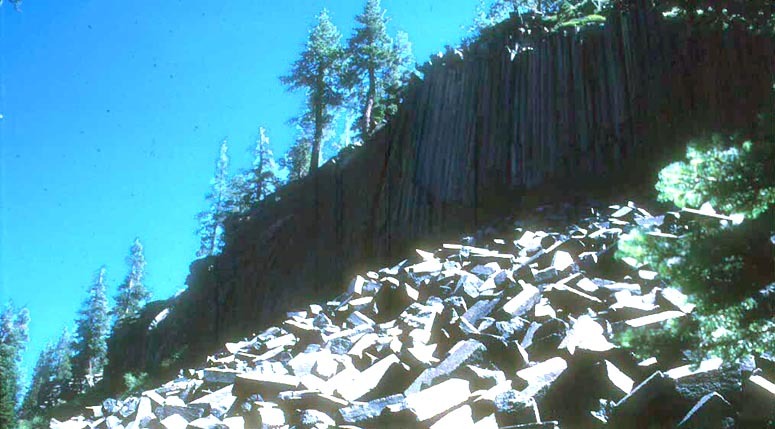 Devils Postpile NM is a highlight spot for Madera County birding. The park has beautiful Rainbow Falls (below), behind which a few Black Swifts nest, and extensive forest, in addition to the geologically interesting 'postpile' itself (bottom photo; both shots 19 Aug 1998).